One work and two composers: this is the best way to describe briefly the situation of sources we were confronted with when dealing with the cantata Fuori di sua capanna. – Source 1 (S1): Cantata a Voce sola / e Flauto solo / Giacomo Greber; manuscript D-MÜs 3975 (Münster, Library of the Diocese, Santini Collection). This source is part of an extensive volume comprising various vocal and instrumental works by G. Greber, A. Scarlatti and several unknown composers. Giacomo (Jakob) Greber died in 1731. – Source 2 (S2): Cantata Del Signor / Bononcini: / e flautto; manuscript F-Pn Vm7. 55 (Paris, Bibliothèque nationale). 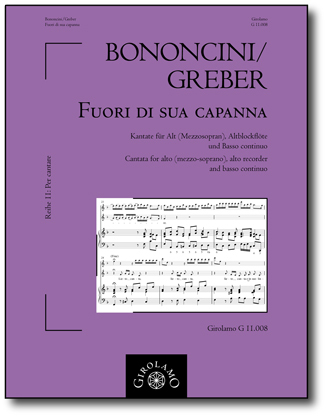 This cantata is part of a volume consisting of 25 Italian cantatas by various composers. Bononcini’s christian name is nowhere to be found. Although the cantata is registered in the index of Giovanni Bononcini’s (1670–1747) works it could also have been written by Antonio M. Bononcini (1677–1726). – The flute part in S1 is most certainly intended for the alto recorder due to its pitch range f' to f''' whereas in S2 it is clearly intended for the traverso considering it is partially written an octave lower within the range d' to c'''. – The bass line in S2 is at some places an octave lower than in S1. On rare occasions the opposite however occurs. – The figured bass in S2 is more precise than in S1. There are figures in S1 however that do not appear in S2. – In S2 only four slurs appear whereas S1 contains many more. After having closely examined the differences between the two manuscripts, it still remains impossible to determine the original composer. Therefore we decided to publish the cantata under both names. Considering that Greber’s version for alto voice, alto recorder and b.c. has a most unusual instrumentation, source 1 was chosen as a base for this edition. But we took over better solutions for the distribution of words and the more detailed figured bass from source 2. All differences between the two sources have been indicated in footnotes in the score and are documented in the commentary. The accidentals and the spelling of the Italian text have been modernized with no further comment. All additions by the editor are indicated. fa che mai si parta il maggio. e d’amar già mai mi pento. flies from beech to beech. make that May will never end. to the rising red of dawn. makes Love to sheer torment.